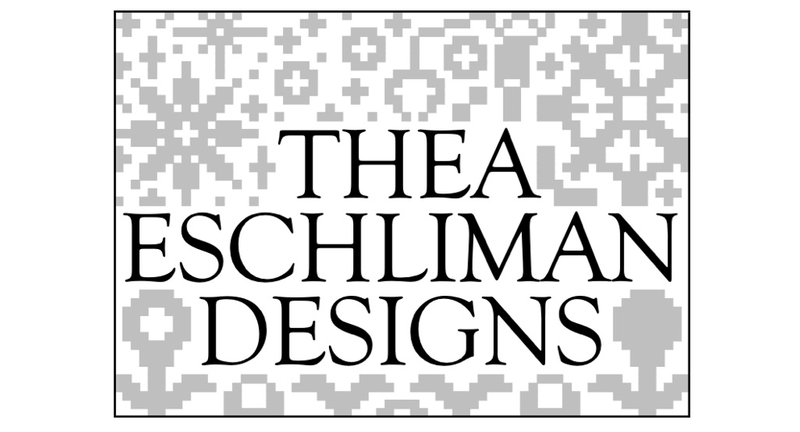 Thea Eschliman Designs: Pop Blossoms! Boy oh boy this weekend could not come fast enough. Before I am allowed to enjoy it though, I promised myself that I would finish editing and publish my latest hat pattern. Technically I was supposed to do this last week before I was allowed to see Harry Potter but that crazy heat wave won the battle, no work was done, but movie's were seen and arctic air conditioning enjoyed. 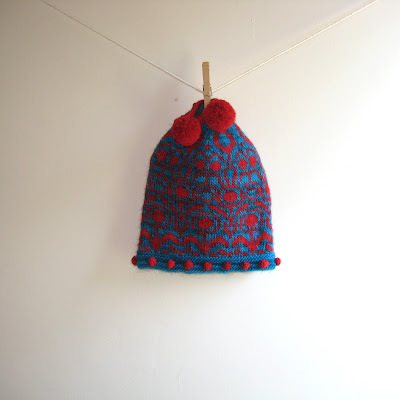 This hat is written for a one size fits most adults in DK or Heavy Worsted Weight, but the chart repeats are fairly short so the hat is easily customizable for smaller or larger heads. US Size 4 16" or 24" circular needle and 4 or 5 DP needles for decreasing. US Size 7 16" or 24" circular needle and 4 or 5 DP needles for decreasing. 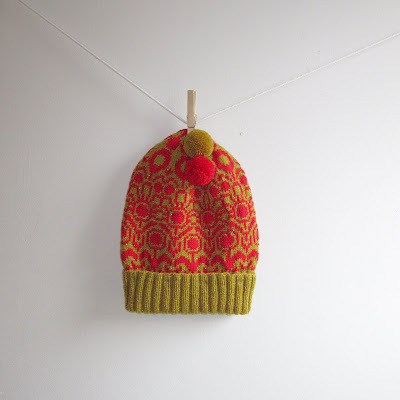 Both hats require a tapestry needle. Optional Pom Poms require extra materials found on my tutorial. Both measure 18 inches in circumference give or take a few eighths of an inch (measurement taken with hat lying flat. The red and gold hat fits my 24" monster head just fine but the blue and red hat is a bit tight. Different yarns just stretch differently so keep that in mind when choosing yarns and adjust pattern repeats accordingly. Random Thoughts about the Pop Blossoms Hat. - The flowers remind me of Takashi Murakami's work but without the faces. - I branched out and took two yarns that I thought were yuck but were in my stash for some reason, put them together, and ended up loving the result. I am speaking of the red and gold. - No matter how much I think about making sure the row jog is in the back I inevitable will take all my pictures with it in the front and then lose my camera before being able to take replacement pictures. -I am completely inconsistent with my spelling of "bobble" and realized that I sometimes write in "bauble" and will switch back and forth using both in the same pattern. I think I caught them all in this pattern, but if you see otherwise feel free to let me know. -Frankly, sometimes I am just completely inconsistent in my use of the English language. I am working on a Pop Blossom Mitten pattern to go with the hat. I am in need of some test knitters. 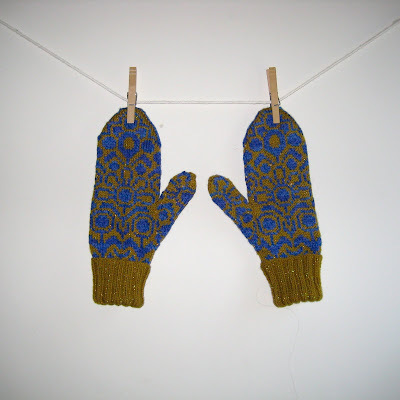 If the picture below interests you and you would like to test knit the mitten pattern for me, please let me know via Ravelry message or email me at wonderfallz(at)gmail(dot)com. I need people to test knit the pattern in a sport weight for a small adult mitten and a worsted weight for a large adult mitten. As a thank you I would send you one of my other patterns that I sell through my Ravelry store. Just a heads up the pattern is still in a rough stage, no gauge or size info included yet, but the chart is pretty much finished. I would like to hear back about size and fit by August 19th. Both mittens need not be finished by this date, just one.